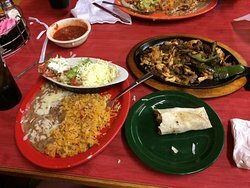 2 rolled flour tortillas w/ your choice of chicken, shredded beef, ground beef, vegetables or beans, served w/ rice & refried beans. 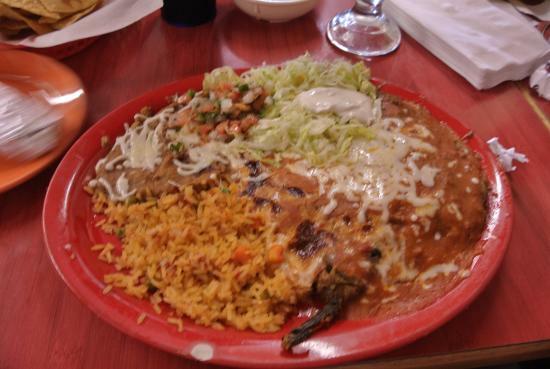 2 enchiladas w/ your choice of beef, chicken, cheese, vegetables or beans, served w/ rice & refried beans. 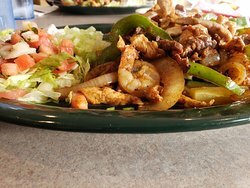 2 hard corn tacos filled w/ your choice of beef or chicken, cheese, lettuce & tomatoes, served w/ rice & refried beans. 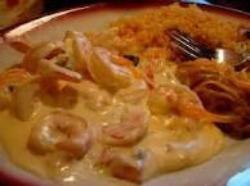 10 inch flour tortilla stuffed w/ chicken, shrimp, peppers, onions & tomatoes, covered w/ cheese sauce & guacamole. 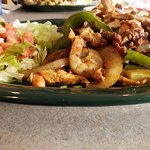 Served w/ rice, beans, lettuce, sour cream & pico de gallo. 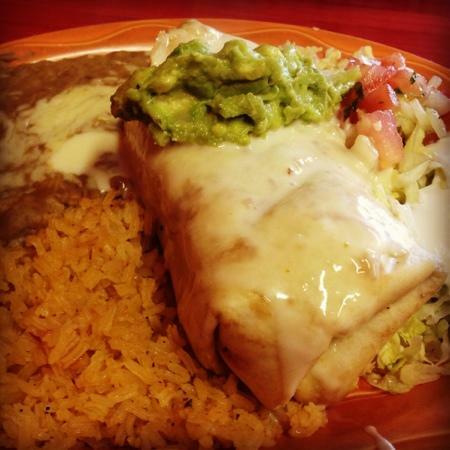 10 inch flour tortilla stuffed w/ beans, cheese & your choice of chicken, shredded beef, carnitas, (pork) or vegtables. 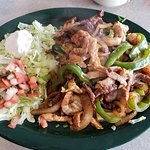 2 grilled steak, onions & cheese tacos on flour or corn soft tortillas, served w/ rices & refried beans. Scrambled eggs w/ mexican sausage, served w/ rice, refried beans & tortillas. Scrambled eggs w/ spinach, served w/ rice, refried beans & tortillas. Eggs over-easy topped w/ ranchero sauce, served w/ rice, refried beans & tortillas. Large tortilla filled w/ egg chorizo, bacon & yellow cheese covered w/ ranchero sauce, served w/ rice & beans. Large tortilla filled w/ egg chorizo & yellow cheese covered w/ ranchero sauce, served w/ rice & beans. 5 oz. Pork chop served w/ 2 egg rancheros & red potatoes. 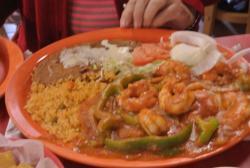 Eggs, peppers, onions, tomatoes topped w/ cheese dip, served w/ rice, refried beans & tortillas. 1 chicken burrito & 1 beef taco. 1 pork tamale & 1 beef hard taco. 1 beef enchilada & 1 chicken enchilada. 1 shredded beef burrito & 1 chicken burrito. 1 bean enchilada & 1 cheese enchilada. 1 tostada & 1 chicken enchilada. 1 cheese poblano pepper & 1 ground beef burrito. 1 beef hard taco & 1 beef tostada. 1 steak burrito w/ cheese dip & topped w/ guacamole. 1/2​ lb. Hamburger topped w/ cheese, mayo, lettuce, tomatoes & onions, served w/ french fries. Mixed greens, grilled chicken, cheese, chips & dressing. 6 oz. Chicken breast w/ mayo, lettuce, tomatoes & onions, served w/ french fries. 1/2 lb. Hamburger topped w/ mayo, lettuce, tomatoes & onions, served w/ french fries. Fried flour salad shell filled w/ mixed greens, cheese, chips & your choice of ground beef or shredded chicken & dressing. Fabulous food. Fair prices. 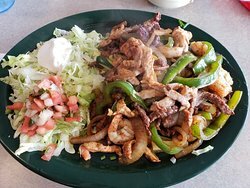 The carnitas were one of the best I have had. Service was excellent! We will be back. I stopped here for lunch with a co-worker. I had the scrambled eggs and chorizo which was delicious - it came with Mexican rice, refrios, lettuce salad, and 3 flour tortillas. The servings were generous. The service was fast and friendly. 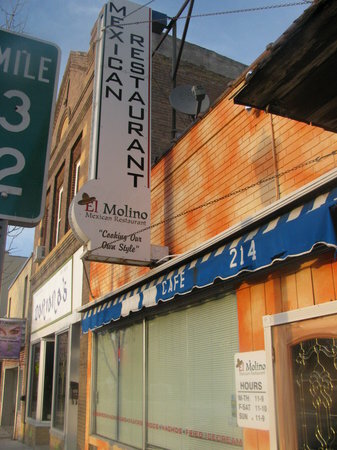 Get quick answers from El Molino Mexican Restaurant staff and past visitors.